The summer travel season is around the corner, and so the booking of cheap flights from USA to India and other destinations is in full swing. We’re up with good news for those who have already booked or are about to book United Airlines flights for traveling this summer. The Chicago-based airline’s inflight entertainment has turned over a new leaf with the launch of personal device entertainment on board. Travelers will be able to access free television shows and movies on United Airlines flights, using their personal laptops, Apple IOS devices and Android phones. United Airlines’ personal device entertainment facility for zero-cost viewing of shows and movies has been installed on more than 200 planes which were earlier equipped with DirectTV live streaming. 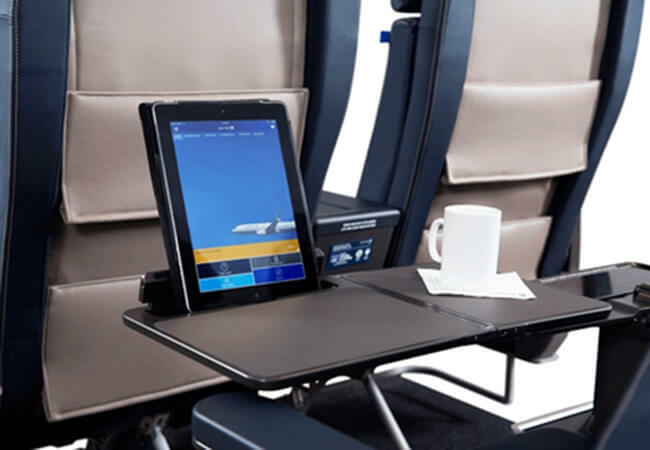 United Airlines’ personal device entertainment options being available on all Wi-Fi equipped aircraft for long-haul flights, travelers don’t need to load their devices with lots of entertainment media content, visual or audio. They just need to carry a laptop or Android or Apple IOS device to access United Airlines’ free inflight entertainment library during their flights from US to India. They can also opt to purchase DirectTV for live viewing. How to Watch Free Movies on United Airlines? How to watch free movies on United Airlines flights using your personal device? Travelers need to install the United app on their Apple IOS or Android phones or tablets in order to access United Airlines’ inflight entertainment programs for free. There is a different way for laptop users to avail free entertainment options on United flights from Chicago and other departure airports in the US, according to a spokesperson of the airline. Onboard complimentary cardboard phone stands will make United Airlines’ personal device entertainment a hassle-free experience. The cardboard phone stands that uphold devices for travelers to enjoy hands-free viewing will be available in all travel cabins by late May or early in June. Most of the planes in United Airlines’ fleet will have more in-seat power outlets this summer travel season so that travelers’ personal devices remain charged throughout the flight. United Airlines’ inflight entertainment system has been upgraded to offer better options for travelers with disability. “Accessible Entertainment” is the whole new category of on-demand seatback entertainment for the differently-abled travelers. The “Accessible Entertainment” section makes United Airlines’ inflight entertainment options easily accessible and enjoyable to travelers with hearing difficulties or vision challenges. The airline offers about 20 audio-descriptive movies and TV shows for them. A music video playlist from VEVO is also among United Airlines’ personal device entertainment options this summer travel season. Travelers can also access relaxation and meditation content from the airline’s inflight entertainment library on flights to India from Chicago, Houston, Los Angeles, Newark, Denver, San Francisco and Washington Dulles.